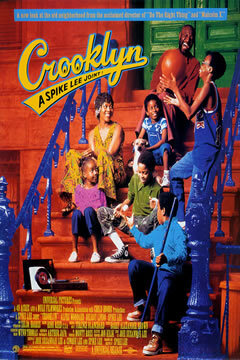 A semi-autobiographical work, Spike Lee’s Crooklyn (based on a screenplay by siblings Joie and Cinque) is the story of the Carmichaels, an African-American family living in 1970s Brooklyn. Woody Carmichael (Delroy Lindo) is an out-of-work musician who’s making the most of his unemployed status, spending his days composing his own brand of music. His wife Carolyn (Alfre Woodard) must therefore return to work in order to support their five children. Daughter Troy (Zelda Harris) doesn't get along with her four brothers, all of whom specialize in stirring up mischief. She bickers with them constantly, and rolls her eyes at their childish behavior. But over the course of one eventful summer, Troy will learn that love and understanding are necessary tools in overcoming any difficulties life throws your way. Crooklyn is a lighthearted movie, certainly one of Spike Lee’s lightest to date. Yet while it might not have the dramatic punch of the director’s more challenging films (Do The Right Thing, Malcolm X, Jungle Fever), Crooklyn is, by no means, all fun and games. Woody and Carolyn argue often, mostly over money but also because Carolyn wants her husband to go back to playing popular music. Having spent years in a successful band, Woody's tired of playing to appease others, and now wants only to perform his music, even if there isn’t much of an audience for it. The two also take a different approach to the household finances. Carolyn works hard for the money that helps them scrape by, whereas Woody doesn’t think twice about bouncing the occasional check, putting them right back at square one. Even in raising the children, they don’t always see eye-to-eye. Carolyn is a strict disciplinarian, demanding the kids finish every bit of their dinner (right down to the much-despised black-eyed peas). Woody brings home ice cream and cake for dessert, often against his wife’s wishes. The tension found in Crooklyn may not be on the same scale as Lee’s more notable works, but does provide a glimpse into the personal drama of home life, and the conflicts that arise within that environment. Despite Crooklyn’s forays into the dramatic, there’s no denying Lee looks back on this time period with genuine nostalgia. Even the most emotionally charged scenes have a breeziness about them, a softer tone lurking just underneath, and if Crooklyn is any indication, the director harbors nothing but fond recollections of his own childhood. That’s the way it goes with memories, especially when you’re surrounded with love: even the times that weren’t particularly good somehow feel as if they were.